Editor’s note: Jim Casale is back this week with his second Grinder Finance article. This series is perfect for the average player looking to stretch their Magic budget just a little bit more, so enjoy! So with the prerelease looming this weekend, it’s a good time to talk about what to do before a new set release. I will preface this by saying that, 99% of the time, it’s not worth pre-ordering new cards. The ones that are pre-ordering quickly become not worth pre-ordering and written media is not a quick enough media to inform you of good buys. For that reason, I intend this article to expand on the ways to self evaluate cards and determine if they are worth ordering for you. An important distinction to make is how this set fits into the rotation scheme and how it affects drafting. Sets that are released and replace the booster packs that are currently being drafted have a different impact on older cards than sets that change or add to the current draft format. For example, the release of Fate Reforged did not remove Khans of Tarkir completely from the draft format. Yes you drafted one less pack, but it is still being opened. What this meant is that the supply of cards from Khans of Tarkir was still increasing while the bottleneck for deck building would be cards from Fate Reforged. Unlike in Modern, Standard bottlenecks are quickly solved by the supply of cards from drafts and Magic Online redemption (although this happens much later). Being able to predict the bottlenecks for decks is a difficult task, but very rewarding if you are able to figure it out. Standard has the same style of bottlenecking that is more pronounced in Modern but it lasts for a much shorter period of time. When the Esper Dragons deck became popular in Standard, Dragonlord Ojutai was a $35 or more card for a few weeks, not months or years like in the case with Modern. Being able to stay ahead of that crowd by purchasing cards during their cheap period is the way to make playing Magic more affordable. Now what we have now with Magic Origins is a completely new draft format. The bottlenecks for the upcoming standard will likely be cards from Khans of Tarkir block and the absolute most powerful all-star cards from Magic Origins. Due to the fact that Dragons of Tarkir was not drafted as much as Khans of Tarkir despite being a large set since drafting was cut off early with the release of Modern Masters 2015, I think the cards in the set have the largest ability to get expensive. We’ve already seen how many great cards have come out of the set despite it being one the lowest pre-order prices in recent history. I am going to suggest anyone who doesn’t own all the cards from Dragons of Tarkir that they might play to pick them up quickly. Outside of the obviously power cards like the Dragonlords, Deathmist Raptor, Collected Company, and Kolaghan’s Command, there are a lot of cards that don’t get enough appreciation. I’m going to highlight a few I’ve even begun to grab in the past few weeks to bolster my collection. Ojutai’s Command & Silumgar’s Command: We’ve seen from the other 3 Dragonlords’ Commands, the power level is there it just needs to find a use for the modes. Despite the fact that Ojutai’s Command is the Buy-A-Box promo, I think it has room to grow. It has a lot of upside being able to return the new Jace and Gideon planeswalkers to the battlefield. With the impending rotation of Hero’s Downfall, Silumgar’s Command is the only card able to destroy planeswalkers. That alone may bring up its playability. Den Protector: You almost always see Deathmist Raptor accompanied with Den Protector but there are also many green decks that will just play Den Protector by itself. At a $5-6 rare from an under-opened large set it doesn’t have a lot of financial upside but can see a week or two where supply is pressured due to the “Deck of the Month” syndrome and you’ll wish you already owned them. Ojutai’s Exemplars, Risen Executioner, Dragon Whisperer, Shaman of the Forgotten Ways, Dragonlord Kolaghan: What do all of these cards have in common? They’re pretty close to bulk level mythics and have decent enough stats to see Standard play. 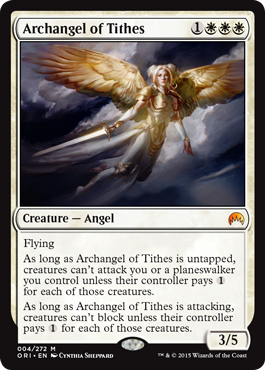 With a lot of important Theros staples rotation soon, I don’t think there will be a cheaper time to pick these up. The downside is that you never play them in the next year and they stay the same price. Soulfire Grand Master: Wait, what? This isn’t from Dragons of Tarkir. Well if you thought that, you are correct. This is a personal opinion of mine but I think Soulfire Grand Master will fit perfectly into the upcoming metagame. It’s at an all time low and casual appeal should continue to keep it buoyed for the next few years. I can see it filling a similar role to Rakshasa Deathdealer and Fleecemane Lion because it is a 2 mana creature that can eat your excess mana later in the game for value. Fate Reforged is a rather unpopular set so there could be supply problems in the future. So enough about old cards, what do I buy from the new set? The only thing I’d recommend ordering is painlands if you don’t already own them. We’ll have them for another few months and it’s unlikely you’ll be able to pick them up for much less than $2. It’s hard to go wrong when the old Core set lands are still worth a few dollars after being printed into oblivion. I’m honestly not very jazzed on the price points of many of these cards. I think the trajectory will look a lot like M15 and we will see large price drops across the board in the next month or so. I’ve personally only ordered 3 Erebos’ Titan because I know I will be playing them on release day but nothing else really strikes me as worth buying currently. That being said, I’m cautiously optimistic about a few cards. The more times I read Gilt-Leaf Winnower the more I think it’s a lot like Flame-Tongue Kavu and less like Skinthinner. I’m going to try to pick up some at the prerelease for a buck or two and hang onto them for later. It’s hard to evaluate the Menace ability but if this was a 5 mana 4/3 flyer it would probably get a lot more looks. I think there is a strong parallel to Icefall Regent as it also has a relevant tribal type and evasion. I’m also pretty interested in picking up some Mizzium Meddlers on release day as it will be a promo given to everyone. I think the card could see some looks in Modern as a replacement that fills in for Spellskite while Kolaghan’s Command remains popular. That being said I hope you enjoy the pre-release and next week I’ll talk more about Modern and the future impact of reprints on the price of decks. I’ve been acquiring super cheap playsets of painlands for days. I’ve gotten some for just over $1 a land (Caves of Koilos) and no more than $2 for Llanowar Wastes. Unless I’m mistaken Abzan is going to rule standard still and Rhino and Taz dodge Languish…so Llanowar Wastes is going to remain popular. 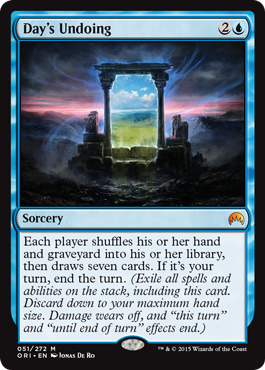 Plus there’s just value to having lands for trading without having to break the bank on a newly printed card. 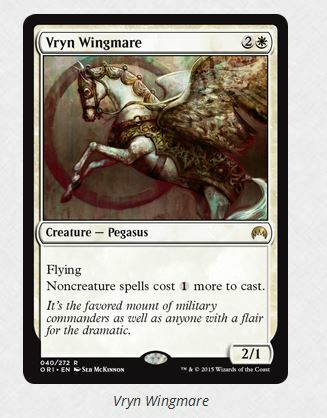 Surprised to hear that you don’t like Harbinger of the Tides at a $5 or lower price point….anything I’m missing with him that I should avoid?